Carve Me A Bear! 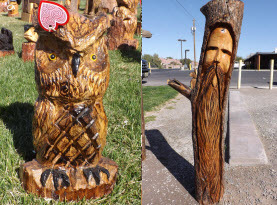 Chainsaw Carvings supplies people with rich offerings of unique, one-of-a-kind sculptures of wooden carvings; hand crafted by Clark the Carver with his extraordinary talents and trusty chainsaws. 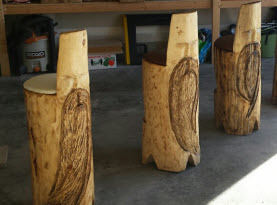 Crafting an array of animals from wolves, bears, dogs, cats, and birds, to mountain men and wizards to totem poles and tikis, along with furnishings, memorials and planters, Carve Me A Bear! 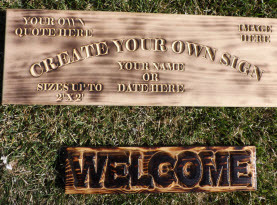 Chainsaw Carvings also includes custom orders to accommodate the ideas for any gift or avid collector. Clark has been applying his craft for over 30 years, gaining the experience and perfecting his talents. His art are truly masterpieces. Among the many animals Clark the Carver of Carve Me A Bear! 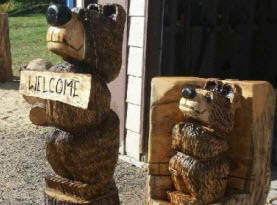 Chainsaw Carvings crafts is raccoons. Raccoons appeal to many folks being nature’s little bandits. Clark’s carvings include all the important details including hand-painting the raccoons shadowed eyes and dexterous fingers to the bushy tail. Raccoons are very intellectual, but are often classified a pest with their intrusions on homeowners. Raccoons are adaptable and their adorable dexterous front paws are equipped with long fingers they can use to find trouble and consume their meals. Generally, raccoons will pluck their meals from the water. Typically nocturnal, their lightening fast reflexes retrieve crayfish, frogs, and other aquatic delicacies. With their irresistible cuteness some people have adopted them and domesticated them as pets. While some people have tried to tame real raccoons and keep them as pets, many more people love to collect raccoons in different forms such as 3D objects, posters, paintings, photographs, calendars, and so on. With Carve Me A Bear! Chainsaw Carvings, Clark the Carver can carve you a beautiful three dimensional raccoon finding mischief, crawling through a log or any other delightful pose for your collection, or as a gift to someone who adores the little bandits.